A Map of the Peninsula of India. 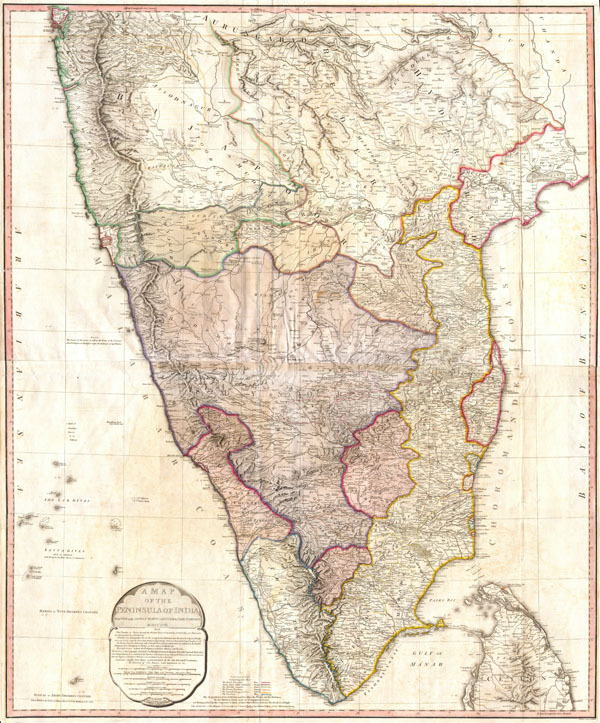 One of the largest and most impressive maps of India to appear in the 18th century. Depicts the subcontinent from Bombay ( Mumbai ) and Aurungabad, south including the northern half of Sri Lanka ( Ceylon ). Printed in 1793 in London by William Faden, 'Royal Geographer to the King and to the Prince of Wales.' Includes the routes of various military marches and campaigns including the 1784 March of British Prisoners from Condapoor to Madras, the march of the Marquis of Cornwallis, the march of General Medows, and the march of General Abercromby. Also shows the acquisitions of the British through the Partition Treaty of 1792. The whole is masterfully presented in visually stunning almost three dimensional detail and stunning period color. A must for any serious collection of south Asia maps. Compiled chiefly from papers communicated by the late Sir Archd. Campbell, the surveys of Col. Kelly, Capt. Pringle, Capt. Allan, etc. William Faden (1750 - 1836) was an English Cartographer and publisher of the late 18th century. Faden worked under the direction of Thomas Jefferys. Jefferys held the position as "Geographer to the King and to the Prince of Wales", and upon his death in 1771, this position passed to William Faden. By 1822 Faden published over 350 known maps, atlases, and military plans. Faden had a particular interest in the mapping of North America and is best known for his important publication of the North American Atlas. William Faden is also well known for his publication of the first maps for the British Ordnance Survey in 1801. Following his death in 1836 Faden's firm was taken over by James Wyld. Very Good Condition. Light age toning and transference. Minor wrinkling to center – see photo. Minor repairs and reinforcement to verso. Blank on verso.